, a very learned English historian, was born at Chiton, in Warwickshire ‘, at which place his father, the subject of the preceding article, at that time resided as vicar and was baptized there by immersion, on April 23, 1686. If this account be exact, his progress in grammatical learning must have been very rapid and extraordinary; for it appears that he was admitted a member of University-college, in Oxford, and matriculated on July 4, 1698, having then not long entered into the thirteenth year of his age*. He took his degree of B.A. Ian. 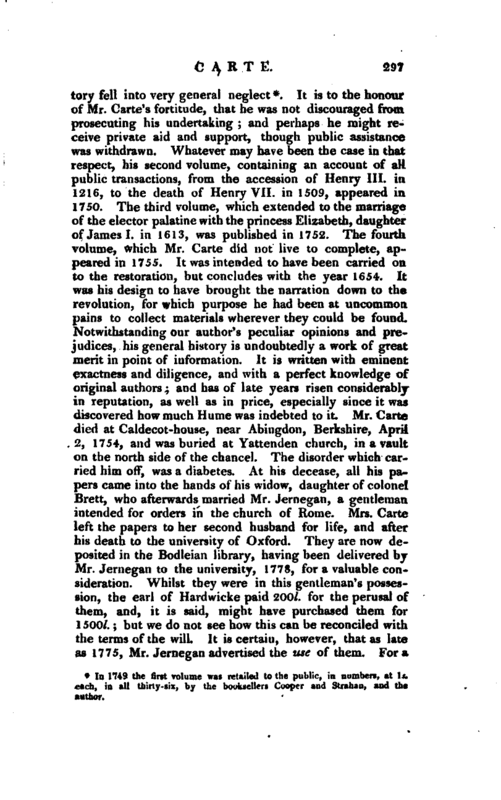 17O2 after which he was incorporated at Cambridge, where he became M. A. in 1705. There were many instances of this kind at and previous to our author’s time. Mr. Nichols was informed that Carte removed from University to Brasennose-college. In the same letter he mentions his design of composing a general history of England and finds great fault, not only with Rapin, but with Ilymer’s Fcedera; but his accusations of that noble collection are in several respects erroneous and groundless. The fact appears to have been, that the man, by his journey and change of diet, and physic, was relieved; but his cure lasted only for a short time. His sores broke out again, with violence, in many other parts of his body; and he returned, in hopes of the same success, to France, where he died miserably, before he reached Avignon. It has been alleged in extenuation of our author’s conduct, that the note concerning Christopher Lovel was not in reality his own; and that he was over-persuaded to insert it, after the sheet in which it was printed had been committed to the press. Bat he could not have been prevailed upon to introduce it, if he had not himself believed the fact; and if he had not at the same time been extremely solicitous to lay hold of any circumstance which he thought would promote the cause of the exiled family. In the preface to his second volume, he continues to avow the truth of the story. 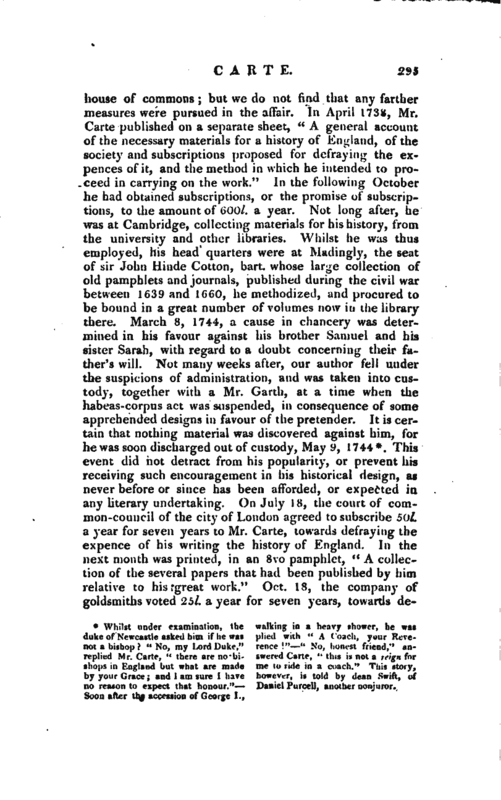 He had, according to his own account of the matter, been an unbeliever with regard to the cure of the king’s evil by the royal touch, till he was convinced of his mistake by Mr. Anstis, who furnished him with those proofs out of the English records which attest the facts, and are printed in Tooker’s Treatise on the subject, published in 1597. If, however, Mr. Carte had examined the narrations with a due degree of scepticism, he would not have been so easily misled. 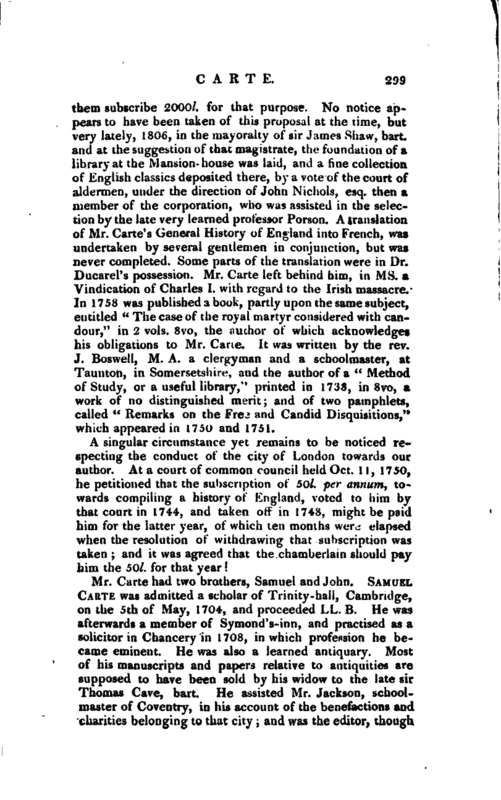 See on this subject Barrington’s Observations on the Statutes, p. 107, 103, notes, and Nichols’s Bowyer, vol. II. /note, p. 495, &.C. 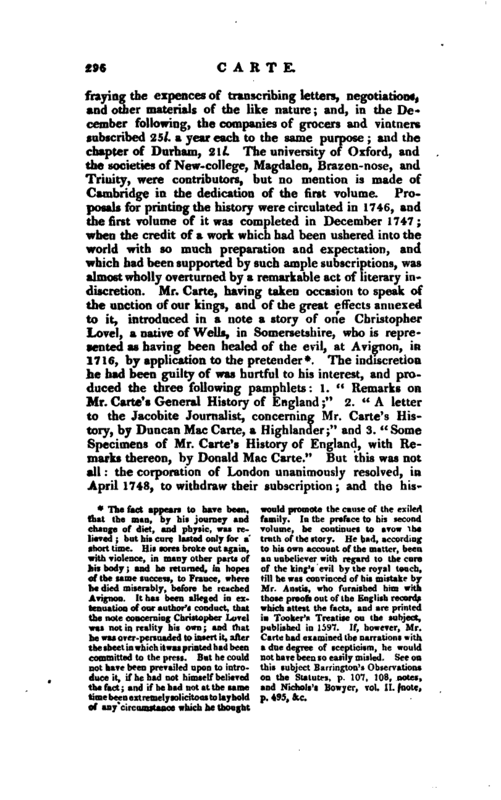 In 1749 the first volume was retailed to the public, in numbers, at 1s. each, in all thirty-six, by the booksellers Cooper and Strabau, and the author. | consideration of 300l. Mr. Macpherson had the use of them; who, from these and other materials, compiled his history and state papers. 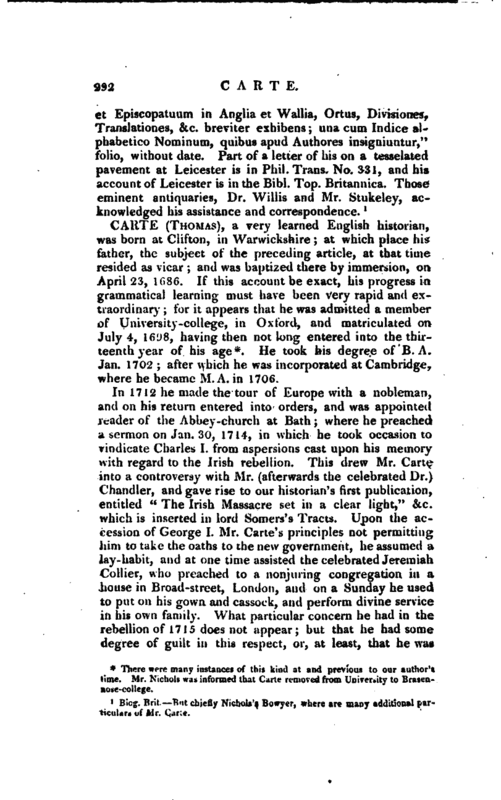 Mr. Carte was a man of a strong constitution, and indefatigable application. When the studies of the day were over, he would eat heartily; and in conversation was cheerful and entertaining; but his external appearance was slovenly and uninviting. Besides the works mentioned, he was the author of the following publications: 1. “A collection of original letters and papers, concerning the affairs of England, from 1641 to 1660,” 1739, 2 vols. 8vo. 2. “The History of the Revolutions of Portugal, from the foundation of that kingdom to the year 1567, with letters of sir Robert Southwell, during his embassy there, to the duke of Ormonde; giving a particular account of the deposing don Alphonso, and placing don Pedro on the throne,” 1740, 8vo. 3. “A full Answer to the Letter from a bystander,” a pamphlet, 1742, 8vo. 4. “A full and clear vindication of the full answer to a Letter from a bystander,” ditto, 1743. The letter from a bystander, was written by the late Corbyn Morris, esq. 5. “Catalogue des rolles Gascons, Normans, et Francois, conserves dans les archives de la Tour de Londres; tire* d‘apres celui du Garde* desdites archives; & contenant la precis & le sommaire de tous les titres qui s’y trouvent concernant la Guienne, la Normandie, & les autres provinces de la France, sujettes autres fois auX rois d’Angleterre, &c.” Paris, 1743, 2 vols. folio, with two most exact and correct indexes of places and persons. This valuable collection, being calculated for the use of the French, is introduced with a preface in that language. 6. “A preface to a translation, by Mrs. Thompson, of the history of the memorable and extraordinary calamities of Margaret of Anjou, queen of England, &c. by the chevalier Michael Baudier,” London, 1736, 8vo. 7. “Advice of a Mother to her son and daughter,” translated from the French of the marchioness de Lambert. This has gone through several editions. 8. “Farther reasons, addressed to parliament, for rendering more effectual an act of queen Anne, relating to the vesting in authors the right of copies, for the encouragement of learning, by R. H.” about 1737. Mr. Carte wrote, also, a paper (the ms. of which is in Mr. Nichols’s possession), recommending a public library to be formed at the Mansion-house, and that the twelve great companies of the city of London should each of | them subscribe 2,000l. for that purpose. No notice appears to have been taken of this proposal at the time, but very lately, 1806, in the mayoralty of sir James Shaw, bart. and at the suggestion of that magistrate, the foundation of a library at the Mansion-house was laid, and a fine collection of English classics deposited there, by a vote of the court of aldermen, under the direction of John Nichols, esq. then a member of the corporation, who was assisted in the selection by the late very learned professor Porson. 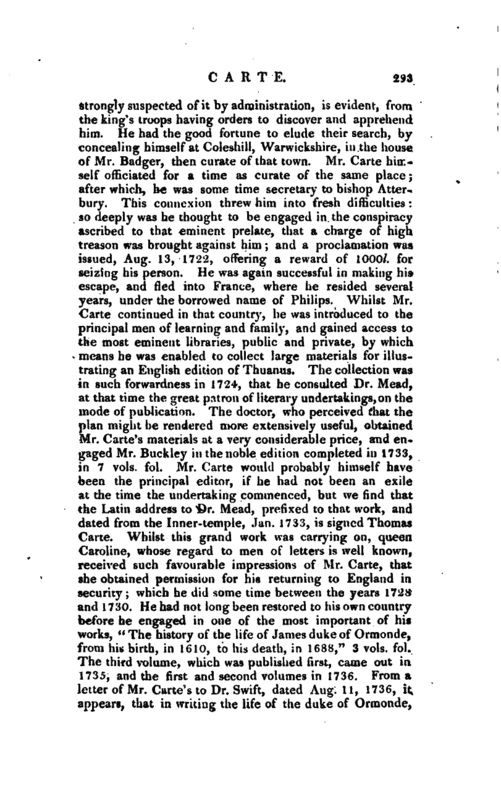 A translation, of Mr. Carte’s General History of England into French, was undertaken by several gentlemen in conjunction, but was never completed. Some parts of the translation were in Dr. Ducarel’s possession. 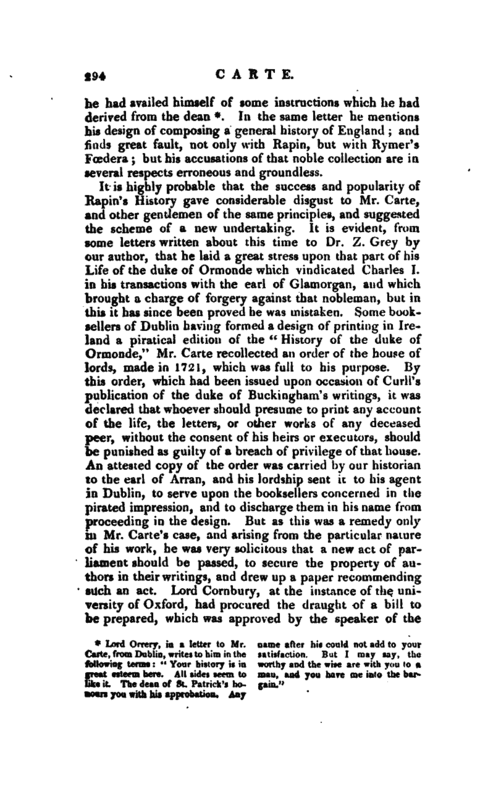 Mr. Carte left behind him, in ms. a Vindication of Charles I. with regard to the Irish massacre. In 1758 was published a book, partly upon the same subject, entitled “The case of the royal martyr considered with candour,” in 2 vols. 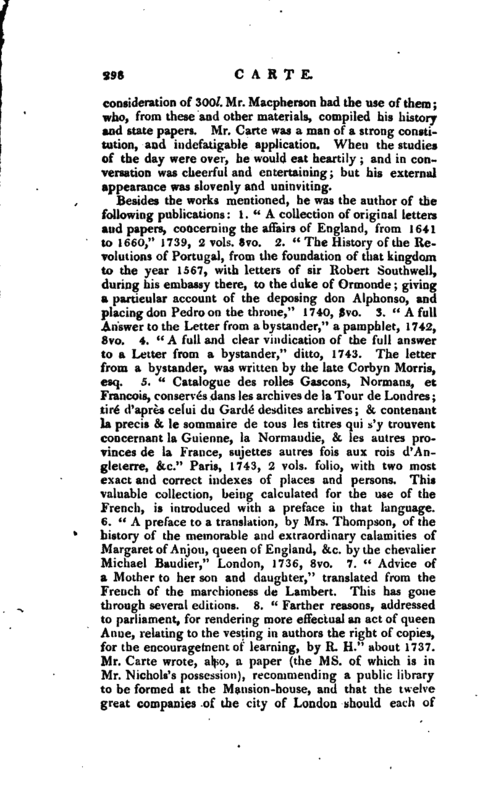 8vo, the author of which acknowledges his obligations to Mr. Carte. It was written by the rev. J. Boswell, M. A. a clergyman and a schoolmaster, at Taunton, in Somersetshire, and the author of a “Method of Study, or a useful library,” printed in 1738, in 8vo, a work of no distinguished merit; and of two pamphlets, called “Remarks on the Free and Candid Disquisitions,” which appeared in 1750 and 1751. A singular circumstance yet remains to be noticed re* specting the conduct of the city of London towards our author. At a court of common council held Oct. 11, 1750, he petitioned that the subscription of 50l. per annum, towards compiling a history of England, voted to him by that court in 1744, and taken off in 1748, might be paid him for the latter year, of which ten months were elapsed when the resolution of withdrawing that subscription was taken; and it was agreed that the chamberlain should pay him the 50l. for that year!